Amid the shock of seeing Edinburgh winning and Glasgow losing you may have missed the Gold Coast Sevens at the weekend. It was the beginning of the World Series that was won last year by New Zealand and the year before by, er, New Zealand and the year before by, uhm, you guessed it. New Zealand's supremacy in Sevens did not stretch to a gold medal at the Commonwealth Games - South Africa beat them in the final - but in the World Series they are always a safe bet to win the competition outright. In fact, there are two near-certainties on the circuit - New Zealand will be excellent and Scotland will be disappointing. You can set your clock by the Scots failing in Sevens. They've done it so often now that nobody bats an eyelid anymore. The Scots got nowhere at the Gold Coast event. They lost to Fiji and Australia (understandable), drew with Portugal (woeful but predictable), beat American Samoa (not particularly hard) and lost to France (again, you could see it coming). France are no great shakes at Sevens and yet they walloped Scotland 26-0. Put those results alongside the last Sevens competition of last season - in England - and the Commonwealth Games matches and Scotland have played 15, won four, lost 10 and drawn one. Actually, look at the entire history of Scotland on the Sevens circuit and you would need to be a forensic scientist to find much, if any, improvement despite a vast financial outlay. And here's the thing. Nobody cares. There has been little or no progress and there is no fallout from failure, because it does not matter to people. True, huge numbers turned up at Ibrox for the Commonwealth Games but huge numbers turned up everywhere. Thousands watched the bowls and the judo and most of those people will never see a bowler or a judoka perform again for the rest of their days. A more accurate measure of Sevens' popularity in Scotland came when the world series was hosted here. Ibrox was not required. Nor Murrayfield. They housed everybody very comfortably at Scotstoun and had plenty of space left over. The Scottish team just chug along to the next glamorous venue and then the next. After Australia they visit Dubai, South Africa, USA, New Zealand, Japan, Hong Kong before finishing up at Glasgow and then London. They go everywhere but they are going nowhere. The SRU has just pulled-off a multi-million pound deal for the naming of Murrayfield and yet they still profit from sportscotland's largesse. This is done because of a medal-chase. Money shovelled into a sport that already generates fortunes all in the vain hope of winning a medal at the Commonwealth Games. Scotland haven't even come close in the past. There is nothing to suggest they are getting any closer. So why throw good money after bad? With the sportscotland funding and however much that is topped-up by the SRU, you have to wonder why. A medal? If it ever comes, it will be one of the most expensive medals in history. When other sports with the ability to reach young people from poorer areas of society - basketball and boxing and more - could badly do with an injection of funding it becomes all the more unjustifiable to throw money at a governing body that's just done a £20m deal with BT. While we're at it, what is in it for the SRU? Nobody at Murrayfield can reasonably argue that progress is being made in the Sevens world. In an ideal scenario Sevens would help produce and develop young players who would then go on to play for Edinburgh or Glasgow and maybe Scotland. If that was happening regularly, or even semi-regularly, then you could see a rationale. But it's not happening. If anything, the opposite is the case. 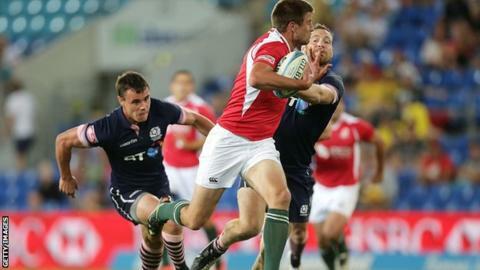 At the Commonwealth Games in Glasgow, the Sevens team had to rely on the XV-man game to fill its squad with acceptable quality. If it's not winning anything, or threatening to win anything, and it's not producing players then what is the point? Why persist in funding when it's not washing its face? Round two of the circuit takes place in December. Expect more of the same from Scotland. And don't expect anybody to get too upset about it.